It is a conveyor that, which is used for general purposes in horizontal and sloping conduction of various kinds of products to different distances. Conveying materials in belt conveyors is supported with an available belt line between a tensioning drum, an engine-reduction system and an actuating drum. The type of belt is determined with the type of product that will be conveyed, and products such as PVC, polyurethane, a wicker belt etc. can be common in choose of types. As well as the application area is absolutely wide-spread, the capacity is quite variable. 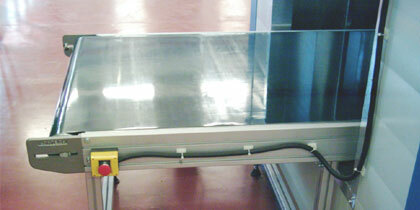 The face conveyor group and frame is made from an aluminum or electrostatic painted steel construction.